Saskatchewan farmers are renowned for their creativity when faced with a problem. 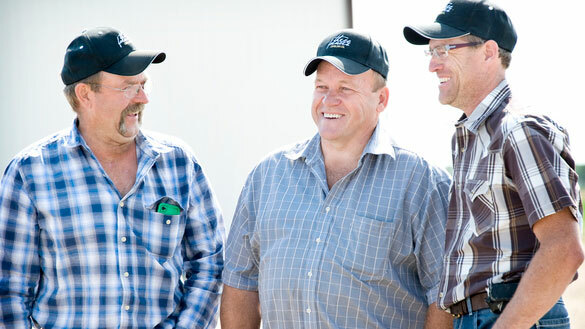 Rankled by years of low crop prices, Colin Rosengren, Dan Vandenhurk and Ron Emde — who all farm in the Midale area of southeast Saskatchewan — saw potential in an ancient, but little-known grain called camelina. Planted late in the fall and harvested in the spring, this crop produces oil with high vitamin E and Omega 3 content. Combine these nutrients with a high smoke point when heated, and you have a great product to use in salads and cooking. However, the three partners didn’t stop at just growing camelina. Instead Vandenhurk’s daughters, Natasha, with a background in economics, and Elysia, who is a Red Seal chef, joined the fold and in 2011 helped produce and market bottled camelina oil under the label Three Farmers. Aside from three flavours of cold-pressed camelina oil, the company also produces snack foods such as roasted chickpeas and pea pops. “Along the way there are different breakthroughs that spiral you into the next growth phase,” says chief executive officer Natasha Vandenhurk. Right now the alternative snack food industry is booming, says Natasha. Three Farmers operates out of Saskatoon, which has been advantageous, she adds, because of the Saskatchewan Food Industry Development Centre. The centre aided Three Farmers with the development of its products (trials, shelf life testing, ingredient sourcing) and also helped to scale the process up for commercialization. The availability of great processing and warehousing resources in the city was also beneficial, Vandenhurk adds. “I think people don’t understand how much food is actually processed here, and how many value-added companies there are,” she says. “And there have been lots of funding programs that we’ve leaned on along the way that are administered by the Saskatchewan and the federal governments.